Size of this preview: 800 × 600 pixels. Other resolutions: 320 × 240 pixels | 2,612 × 1,959 pixels. 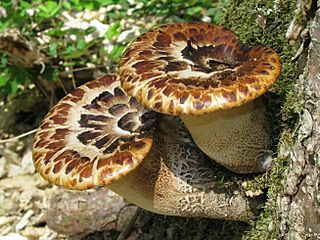 Description: The mushroom Polyporus squamosus Huds. ex Fr. Photographed in Kinderhook Trail, Wayne National Forest, Ohio, USA. "Notes: On standing dead elm." This page was last modified on 19 April 2017, at 18:22.